Wendy Nan Rees offers tips for moving with dogs that will help things go smoother. Moving is a big deal to your family and to your dogs. Whether you move across town, across the country or even to another country, the basics are still the same. Here are some tips for moving with dogs that will hopefully make the experience go smoother for you. Make your dog's health your first concern when planning a move. No matter where you are going, you will need a valid health certificate for your dog if it involves going on public transportation. Make sure your dog is up to date on his vaccinations, and find out when the next set is due. Ask your vet if there are any special vaccinations your dog may need for living in your new location. Ask your vet for refills on any prescriptions your dog takes regularly so you have enough to hold you over until you find a new vet. Keep your old vet's number so you can have your dog's records transferred. If your dog is on a prescription diet or requires special food, make sure you get enough to last for at least two months in case you have a problem finding it where you are moving. Whether you plan to drive or fly to your new home, your dog should travel in a secure carrier. Make sure the carrier has a door you can lock or secure somehow. Make sure the dog has a harness on with a name tag. Label the carrier with both your destination and a friend's name and phone number from the old neighborhood. Secure a large plastic bag with copies of your dog's health certificates and a synopsis of their health records. DO NOT feed your dog before you leave, no matter how much he begs. You don't want him to get sick in the carrier and not be able to to help him. Put a favorite toy or two in the carrier along with a very soft blanket or piece of rug. If you are using a piece of rug, you might want to use double-stick tape on the bottom of it to keep it in place in the carrier. If you're driving your dog yourself and have to spend a night on the road, find out which hotels and motels are dog friendly. Do they charge extra, or have a deposit you have to pay for your pet? Bring food and water from home to avoid digestive upsets while traveling. Load your pet's carrier into the vehicle last, and make sure there is plenty of air space around the carrier so your pet doesn't become overheated. If you stop at a rest area, make sure your dog also gets a break to potty and stretch his legs. If someone is making the move with you, one of you should always stay with your dog at the rest area while the other one goes in. 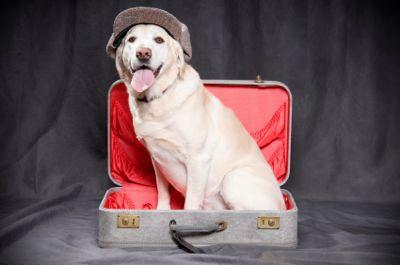 Review the rules and regulations for dog air travel well in advance of your move. Find out whether your dog can ride in a carrier under your seat or whether he will need to ride in the cargo hold. Ask whether the cargo hold is pressurized and climate controlled. Make sure the carrier you use is airline approved. Check with the American Consulate in the country you are moving to find out if the country you are moving to has any special regulations regarding your pet. For example, will your dog need to be quarantined? If so, how long? Consider using a bonded and licensed pet moving company to make the trip easier. Even if you have a very friendly, outgoing dog and nothing stresses him out, you still want to err on the side of caution and keep him confined while your household goods are being packed up and loaded. If you have a dog run or a large, safe crate, let him stay in it. Your dog will be safe and unable run out into the street. Remember, it may not be your dog's fault if one of the workers leaves the door or a gate open and Fido escapes. Finally, pack your dog's belongings last so he feels as comfortable as possible right up to the moment you get ready to leave. Moving to a new home is never an easy proposition, but hopefully these tips for moving with dogs will keep the stress and chaos to a minimum.